The story goes like this: After being on the fence about the merits of installing a smaller race type steering wheel and the reservations about removing the airbag for street use, I was faced with a dilemma. It was brought to my attention that the MazdaSpeed hub adapter was no longer available in the US. Why would one need the MazdaSpeed hub adapter? Well the MazdaSpeed hub adapter is specifically designed for the 3rd gen RX-7. 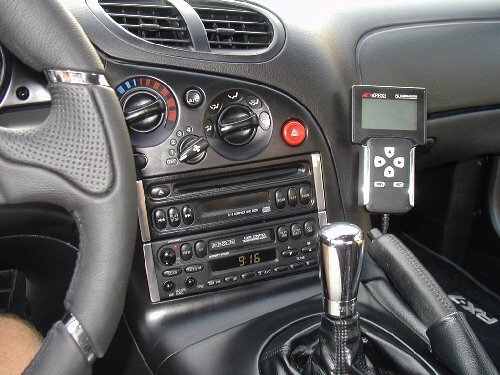 I contains a resistor with an OE plug to trick the airbag sensor malfunction light, the correct OE plug connector for any aftermarket horn button, and the right configuration to maintain functionality of the turn signal return, ie so your turn signals turn off autmatically when you bring the wheel back to center. 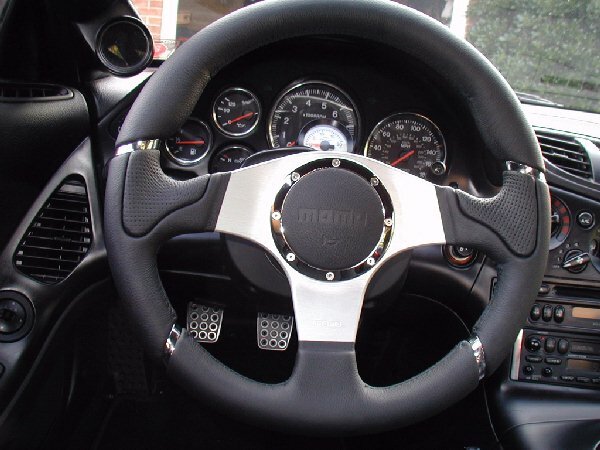 Additionally, it is fully compatible with Momo steering wheels and has trim that closely matches the OE dash. So I figured if I wanted to install a steering wheel, now would be the time or else face some fabrication work down the road. From what I can tell, I bought the last MazdaSpeed hub adapter in the country...lucky me :-) (Ed. I have since learned there is a secret source for these but I do not know where!) So there it sat on my workbench for nearly 6 months awaiting a wheel. Which steering wheel to choose? After seeing one a year or so ago there was no question in my mind which one it would be, the Momo Millennium. This is a 350mm wheel with chrome accents which match the OE dash. 350mm is about as small as you can go before the gauges become obstructed by the wheel. But nothing is ever easy. When I ordered my wheel it seems that the whole country was on national backorder. So my wheel had to come from Italy. This took another 2 months. But I think it was worth the wait. Several things concerned me as I approached this job. The first being the removal of the airbag module and the second being removal of the OE wheel from the steering shaft. The service manual has warnings all over the place about removal of the airbag to make sure it doesn't blow up in your face. Well the removal went without a hitch although I must admit I was sweating quite profusely. First things first though...make sure the steering wheel is straight and the hweels are pointed straight ahead and remember to disconnect the battery! Three nuts accessed from the rear of the steering wheel and two connectors and the airbag module was out. Similarly, one big nut on the steering shaft, a wiggle of the steering wheel and gentle tug and off it came. What did amaze me however was how much the OE steering wheel and airbag module weighed. Compared to the Momo wheel I'd estimate easily 4 times the weight. Installation of the MazdaSpeed hub was a cinch. Thread the OE electrical connector through the hub spokes first and then bolt the hub to the shaft. Plug in the airbag resistor and the horn button power wire. I did have to make a short ground wire for the horn but no biggie. Then bolt on the steering wheel to the hub making sure to use the spacer that centers the horn button, plug in the horn button leads, insert horn button, and bolt on horn cover. Adjust hub adapter trim piece to cover the space between the hub and the steering column and voila. Next was to go for a drive! Well apart from the finished look, I am quite pleased with the result. I was somewhat skeptical of the cost benefit of upgrading to a smaller wheel but in the end I think it was worth it. The hand grips are near perfect for my short fingered large palmed hand. The wheel barely obscures any of the gauges. And the real difference is in steering feel. the car does feel more responsive as smaller steering inputs result in the same response from the car as with the OE wheel. Therefore the car does feel more nimble. Plus with the wheel hand position and new found steering feel you definitely feel like fitting the part of a racecar driver...even if you aren't really one. In summary, money well spent IMO. So I've had this APexi Power FC installed in my car for about 6 months now and am very pleased with it's performance. It's a bit rough around the edges when the engine is cold but it has performed very well otherwise. And much to my pleasure worked perfectly on the track using 94 octane pump gas. But I had a problem with the Commander. The unit is great but there is nowhere to put the thing. I have up until now simply been laying it on the passenger seat where I can reach for it to check out things as I drive. However, take an exit ramp with some degree of abandon or nail the brakes a wee bit to agressively and the Commander goes shooting off the seat to the far reaches of the footwell. Not to be seen again until you stop the car and walk around to the passenger side of the car to retrieve it. This was a pain! The problem is that NO ONE makes a holder for the Commander. I've heard of folks adapting a cell phone mount but this seemed to me a bit of a hodge podge method (although I've never seen one in person) So I set out to make my own. 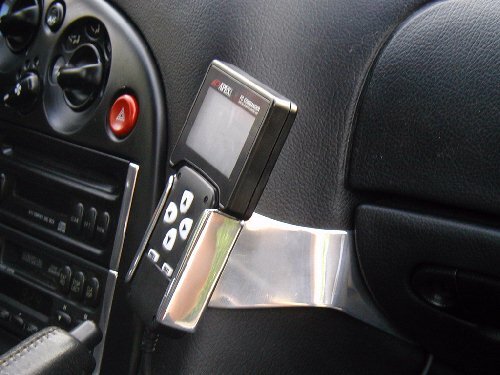 So how do you make a mount that won't hack into your dash, will be easily visible to the driver, won't interfere with passenger comfort, and will fit the commander without making it permenant (so it can be removed for safekeeping to prevent it from walking off in someone elses pocket)? Well, I didn't want it sitting up on top of the dash baking in the sun, in plain sight of uniformed authorities and potential thieves, not to mention the wiring needed to place it there. I also wanted it within arms reach of the driver when strapped in with the racing harness. AND it also had to be attached to the dash in such a manner as to minimize damage to the dash and of course it had to look good. The best place I determined was just to the right of the radio. Not in the passeger foot well but up slightly to be easier to see and to not get in the way of the passengers knees unless they are some 6ft4 giant or something. I figured the best place to afix the bracket to the dash would be inside the glovebox on the right side of the dash. Left/Side View: Note mounting screws inside glovebox. These are not visible with glovebox closed. Right/Front View. Note felt covering to protect Commander surfaces. There is a rigid plastic support just under the dash padding inside the right side of the glovebox opening so it will support the unit and the screw holes are well out of sight even with the glovebox open. The holder I made is a two piece part, one being the actual holder for the Commander and one for the bracket. This design was primarly for easy of fabrication. 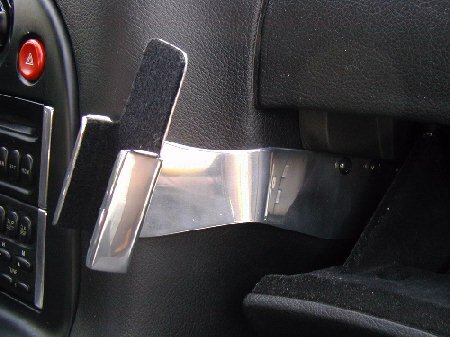 The bracket portion was bent to form to the shape of the dash - or at least as best as I could make it fit, and the holder was carefully formed using the commander dimensions as a template. To protect the Commander itself I lined the holder with felt which also makes for a very snug fit for the Commander. It ain't coming out unless you pull it out! And that's it. Nothing fancy, but something that I had been mulling over in my head for a few months before deciding to jump in and just make one. So after about 12 hours of labor the final product is now in my car. As far as the fabrication goes, well, that would be just me pounding on some alloy stock with a hammer and a bench bench vise and then sweating for few hours over my buffer. 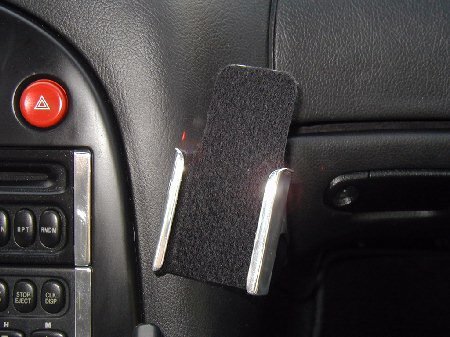 After three prototypes I had a version I was happy with so installed it in the car and is what you see pictured. Postlogue: After some brief road testing I determined that although the Commander is positioned correctly, the poor quality of the display screen make it quite vulnerable to washing out in any kind of sunlight. A shroud will have to be whipped together. More on that later.